Is Dockless Bike Share Right for Your Community? Shared-use mobility is part of a larger movement toward a “shared economy” and “collaborative consumption” (think Airbnb, Zipcar, Lyft, etc). Within that realm, the mobility sector is one of the fastest-growing segments based on revenue. By the year 2025, shared mobility will be a sector worth more than $35 billion. The growth in shared-use mobility is changing transportation planning in a dramatic way — with a direct benefit for active transportation and transit. The more people use shared modes, the more likely they are to use public transit, own fewer cars, and spend less on transportation overall. Bike sharing, like car and ride sharing, is experiencing phenomenal growth. Ridership grew from 320,000 trips in 2010 to 28 million trips in 2016 according to the National Association of City Transportation Officials (NACTO). With the emergence of dockless (or stationless) bike share, cities and campuses have even more choice for on-demand mobility. Bike share originally gained prominence globally as station-based systems. The model is based on users checking a bicycle out from one station and returning it to another station close to their destination. Using smartphone apps, users identify the closest station for each end of the trip. These users can be tourists renting a bike for a couple of hours, or daily commuters. With the rise of dockless systems, bike share has nearly come full circle. From “yellow bikes” to station-based to hybrid (smart dock + smart bike) systems, this recent rapid innovation is taking bike share into new territory, in an effort to capitalize on the strengths of each previous version. Dockless bike share has the potential to further stoke demand for bicycling, and in turn, for improved bicycle infrastructure. It also has the potential to help cities raise the profile of bicycling as a key element of the transportation portfolio. As a first mover in bike share systems, Alta knows what it takes to build, grow and integrate shared-use into mobility systems. With good planning and supportive partnerships, cities can get off on the right foot (or pedal) for building systems that work for everyone. 1. Set Program Goals: A city or campus needs to review overall program goals for mobility and how dockless bike share fits into the overall system. For example, cities may want to prioritize equitable access, public health programs or specific traffic reduction goals. 2. Create a Policy Framework: Your city will need to establish a regulatory framework. Seattle, Washington for example, requires operators to obtain a permit that covers safety, parking, insurance requirements, operations, and data sharing with the city. 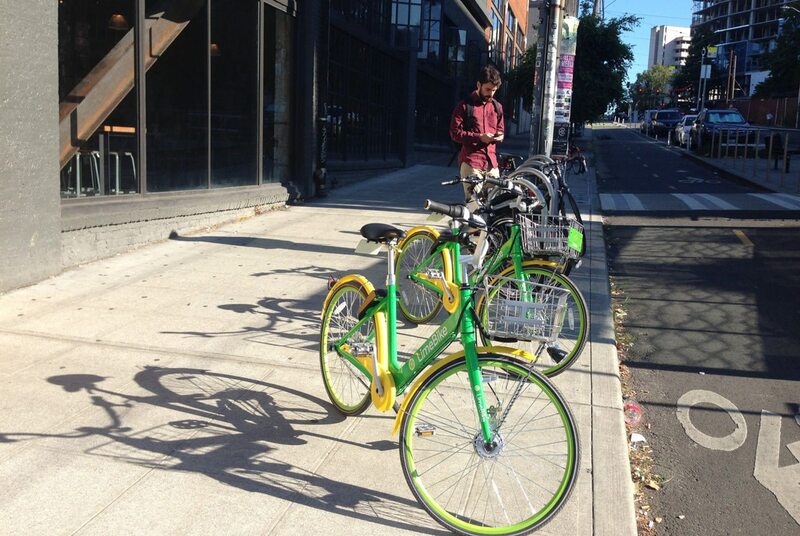 Your city will need to review existing contracts with bike share and bike rental companies. 3. Establish System Boundaries: For system planning, most operators work with cities on boundaries for both testing pilots and program growth. Using geofencing technology, operators collect (and share) data that tracks usage, routes, system problems and more. In fact, the sheer amount of data points to the need for careful planning data collection, privacy, analysis, storage, and decision support. Access to data also means that cities can establish and track performance metrics related to dockless systems and bicycling overall. We can collect hyper-local information about existing conditions, bike behavior, routes, weather, time of day when people are riding, and demographics. We can then use this context-specific data to inform our route planning and infrastructure investments. This will help determine the feasibility of expanding service and identify investments for improving streets, bike lanes, and trails. These results can be further used to track other goals such as carbon reduction or economic activity related to bike share. Bike deployment and bike parking placement can be informed and improved by mapping hot spots of demand for walking, biking, and bike share. 4. Focus on Bike Parking: In most cases, the greatest challenge is parking. All stakeholders need to establish, early on, that dockless does not mean users are able to leave bikes anywhere (an on-going problem as bikes are left in rivers and hanging in trees). In fact, dockless bike share is likely to spur expanded design and policy for bicycle parking and infrastructure overall. In the near term, cities can fast-track bicycle corrals and find more efficient design options close to bike lanes and trails. Over time, cities may replace on-street parking or work with building operators with excess parking. Bike parking should typically be located in areas where users are likely to check out or return a bike, for example near transit stations, civic buildings, and entertainment venues. Alternative approaches to physical bike racks may include using GPS geofences (like Social Bicycles) to create pseudo stations/discreet areas to park bikes or painting rectangles on the ground to designate parking areas. 5. Integrate Programs: In many cities, transportation requires owning a car; other options are either insufficient or simply not available. The integration of New Mobility, mobility-on-demand models, and seamless transport apps will substantially increase the share of trips that are multimodal. Furthermore, the growth of “Mobility as a service” (MaaS) — or private companies supplying transportation and transit as a service — will continue to blur the lines between private and public transport. Cities will need to integrate dockless bike sharing into their overall mobility programs, including Transportation Demand Management, First/Last Mile, and transit system plans. Cities with existing station-based systems may play host to both station and dockless bike share options. 6. Continuously Monitor, Improve and Innovate: Dockless bike share systems face a lot of challenges. For example, supplying enough staff to constantly rebalance bicycles may become economically infeasible. However, there may be possibilities for new mobile docking stations that allow rebalancing of many bikes at once. Using data to rebalance strategically will be key to success. Another challenge is that the public may not tolerate a growing number of idle bicycles on sidewalks. To encourage proper bike parking, companies can offer incentives for users to place bicycles in preferred areas and discourage misplacement.